More On: Tom Clancy's H.A.W.X. 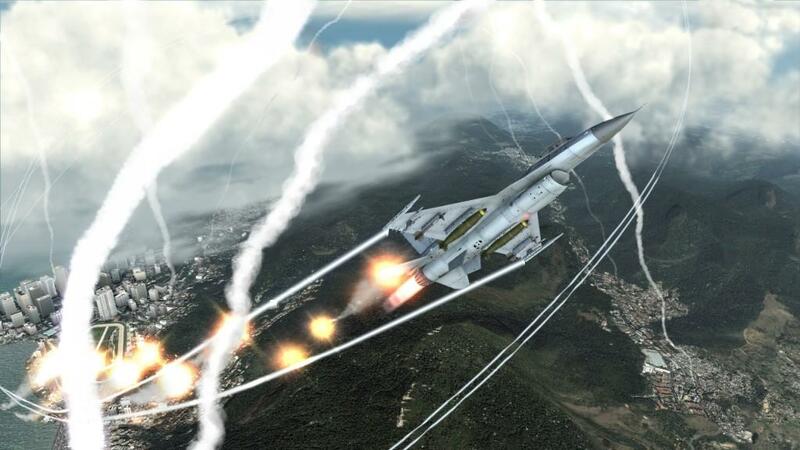 Tom Clancy’s HAWX is an arcade-style flight sim that tries to find ways to innovate in a genre that is somewhat limited; you fly a plane, you shoot down other planes with missiles and guns, and attack ground targets. 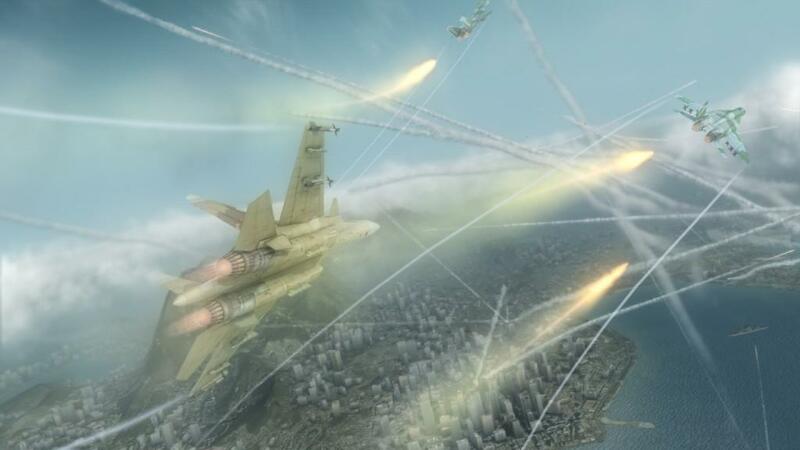 HAWX largely manages to hit all the necessary high notes, the massive air battles (which, as your teammates repeatedly remind you, are apparently “worse than the last Gulf War”), the ground assaults, and the whole expected air war scenario. HAWX tries to do a lot of things; have a politically relevant story, detailed graphics, innovative gameplay, and engaging multiplayer, and when HAWX does well, it soars like an eagle. When it doesn’t, though, this game looks more and more like a pigeon than a bird of prey. In HAWX, an acronym that stands for High Altitude Warfare eXperimental squadron, you play a former Air Force pilot who has left the service to sign on with a private military corporation, or PMC. PMC’s are big in videogames nowadays, with significant roles in the plots of Army of Two and Metal Gear Solid 4; in this game, the PMC is Artemis Global Security, and while the beginning of the game has you running an air-support mission in Mexico from the first Ghost Recon: Advanced Warfighter game, you’re soon fighting various forces around the globe. The story is largely window-dressing; you will miss absolutely nothing by skipping the lengthy mission briefs, and even less if you completely ignore your wingmen’s mindless drivel. They only have a few mission-dependent lines per scenario, and all the rest are repeated over and over. If I ever hear “select zone two and extend” again, I might try and strangle an electronic person. There is no doubt about it: HAWX has gorgeous visuals. The aircraft are intricately detailed, and with more than 50 aircraft to choose from, the Ubisoft team deserves a great deal of credit for making each and every aircraft look fantastic. 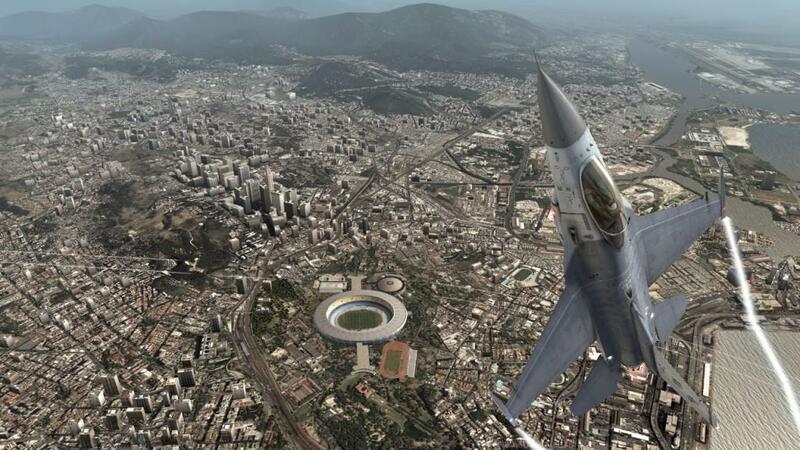 Ubisoft also partnered with GeoEye, a satellite imagery corporation, to produce completely realistic, satellite-accurate models of real-world locations, such as Rio De Janeiro, the Bering Strait, and Chicago. At altitude, these locations look incredible, just as you would expect to find them if you were looking out a commercial jet-liner window, or an actual fighter if you’re one of the few lucky enough to earn that job. Up close, and when flying through (preferably not into) buildings in Free Flight mode, the image resolution begins to suffer a bit and the buildings look out of scale, but anything above 3,000 feet or so looks fantastic. There’s not a whole lot to note on the audio side of the game. It sounds pretty great in surround sound, but all of the rest of the sounds are pretty non-distinct. 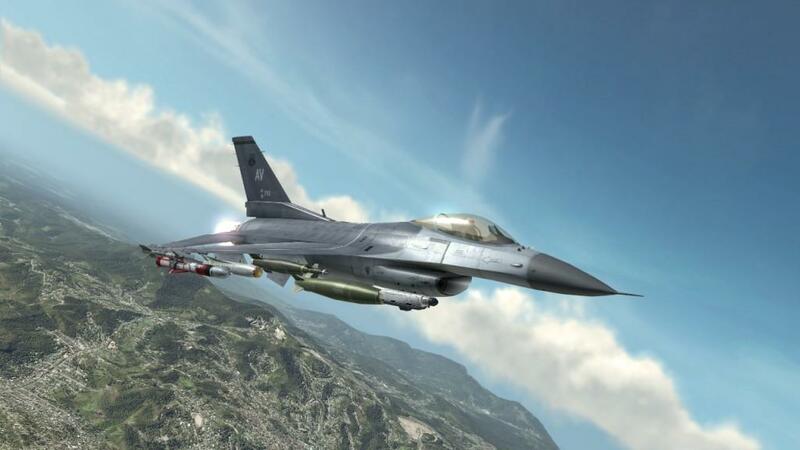 Engine roars are engine roars, missile sounds are missile sounds, One of the problems with flight sims is that you have a fairly limited soundscape in which to work, namely inside a fighter jet. This doesn’t really give the audio technicians a whole of opportunities to make the audio interesting, and HAWX’s audio isn’t. HAWX does try to innovate in the implementation of their assistance-off, or just OFF, system, wherein the game designers took the fact that nearly all modern fighter jets operate on a system called “fly-by-wire”, wherein a pilot’s commands are reviewed by an internal computer which determines whether or not they’re safe, and then makes the plane move. 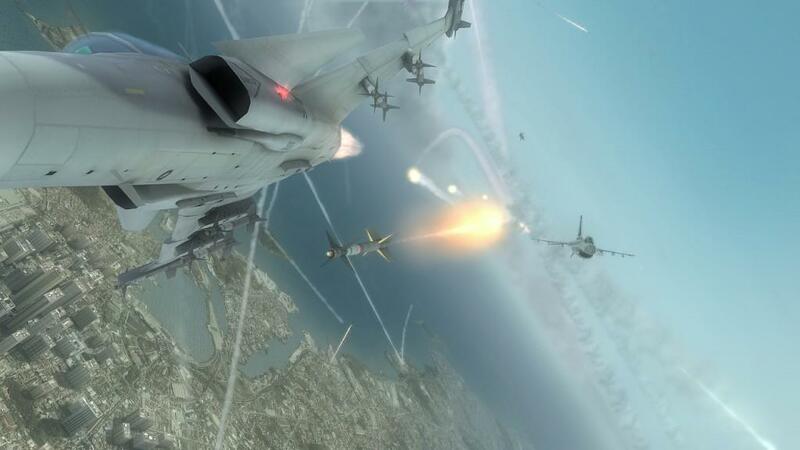 In the world of HAWX, the pilot can turn this assistance system off and gain incredible maneuverability that allows the pilot to dodge incoming missiles and get an advantage on aerial opponents. 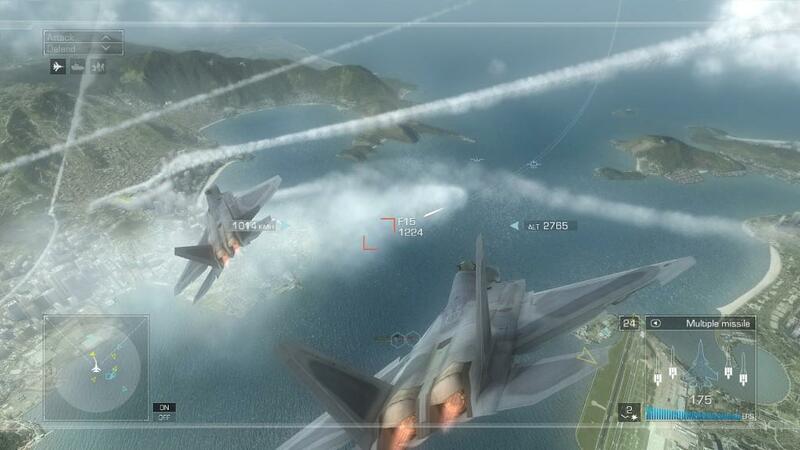 When assistance is turned off, the view is pulled back to an extended third-person perspective. 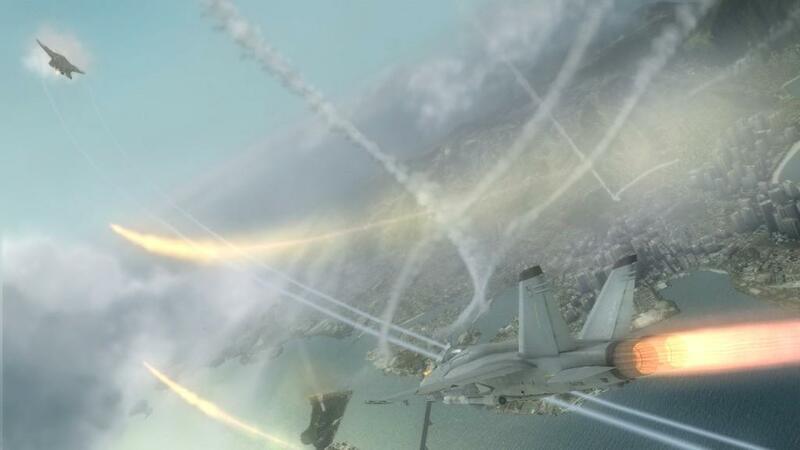 There’s also the Enhanced Reality System, which allows the player to identify a target then fly through a series of gates that directs you to the target, either aerial or ground. I’ve been playing flight sims since 1993, and I’ve never encountered a more obnoxious system than OFF mode and never such a training wheels, hand-holding system like ERS, both of which detracted from the overall experience.OFF mode claims to make you more maneuverable, but in reality it limits your ability to control your aircraft through all the available ranges of motion: pitch, roll, and yaw (side to side). In OFF mode, any attempt at a roll becomes a banking turn; if I’m so maneuverable in OFF, why can’t I roll my aircraft? I understand what the development team is going for here, but I think the attempt fails. 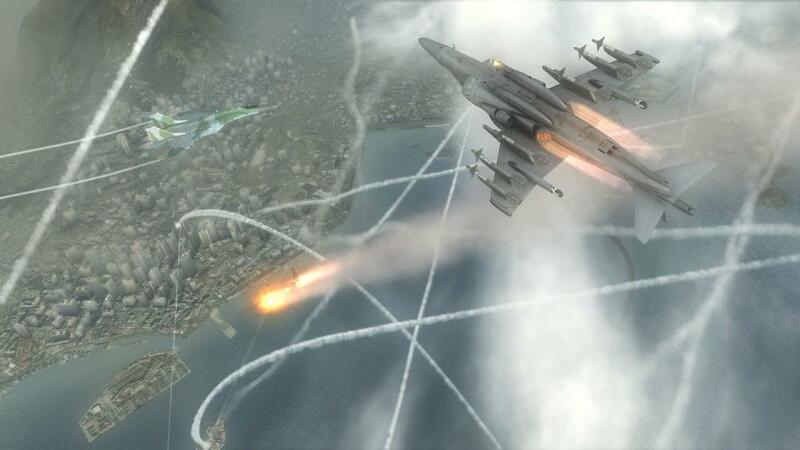 Why not take a page from Ace Combat 6 and just make maneuverable, quality aircraft? In AC6, I can do whatever I want within the limits of physics, without dealing with a wacky camera system; I understand the need to innovate, but I think there’s a lot to be said for taking something that’s been done, and doing it better. AC6 has a nonsensical, overdramatic story, while HAWX has the realism of the Tom Clancy brand behind it, and as long as the gameplay is spot on, this game should be a no-brainer hit. 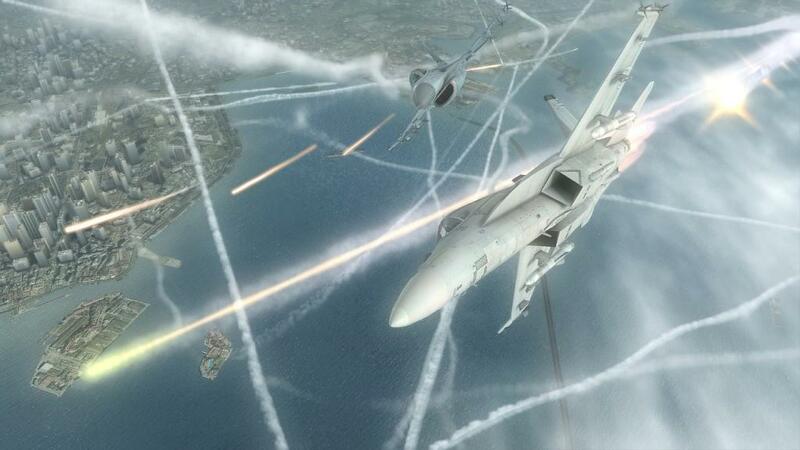 Instead, OFF mode makes dogfights overly complicated, and frankly, after some experimentation, I just never used it. ERS is on the complete opposite end of the scale. 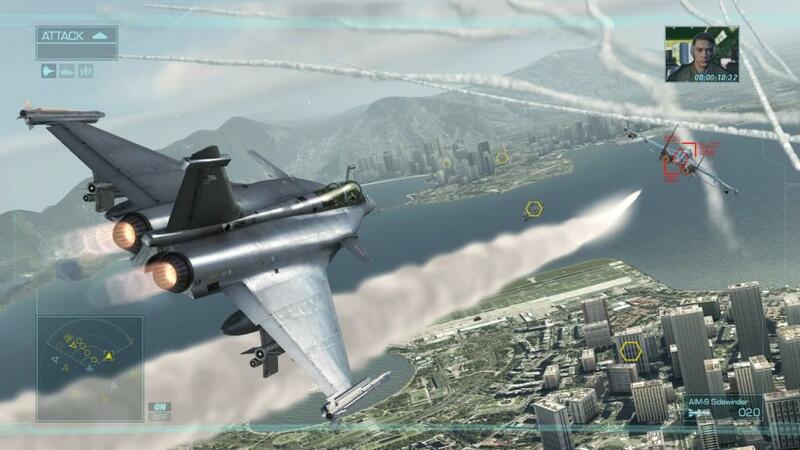 Half the fun for flight sim aficionados is maneuvering your plane in on your foe, dogfighting, really struggling for and earning each kill. ERS puts training wheels on your high-tech fighter, guiding you towards your target, putting you in position, and doing everything but manipulating the controls for you. 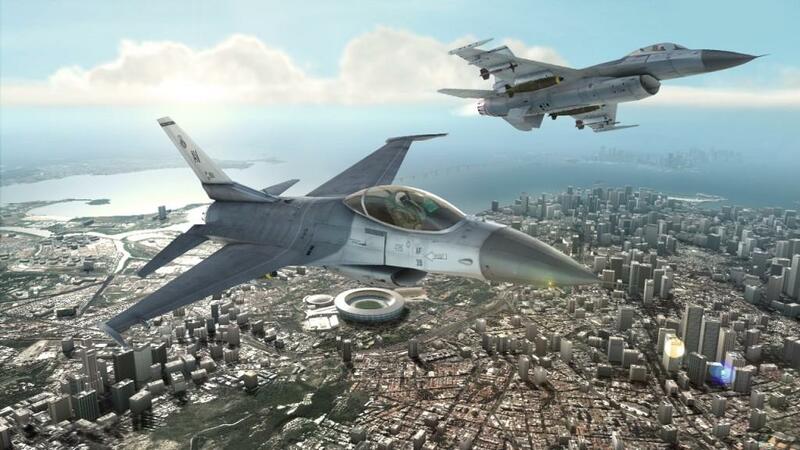 For a true flight sim fan, we love nothing better than fiddling with throttles and aileron trim, but we can get behind a good arcade flight sim that is less about the details but still challenging for us as pilots; ERS just makes it too easy. Like OFF, it’s better to just not use it. HAWX has one major thing going for it; for all its flaws, HAWX is a load of fun in multiplayer. Co-op allows for some real teamwork, and versus modes are fun breaks from your average Halo or Call of Duty match. No doubt about it; HAWX is fun to play. But what hurts it as a game is that it’s only fun or challenging to play if you ignore “features” like OFF mode (which makes it not fun) and ERS (which makes it not challenging); as a gamer, I shouldn’t have to ignore portions of a game to make it fun. Among console flight sims, HAWX may not soar with the eagles, but it’s not a turkey either.